NEM rep confirms ABX was close to making offer, & still possible in 2015. Sentiment = wary, not depressed like last year. Projects in progress will be completed before starting new ones. As the margin of Advances over Declines increases long term, the intensity of the declines begins to fade. It will take a lot of that to neutralize the Psy-War activities of the last 3 years. This is so now. Support, in my opinion, is as low as 18, and as a result we will hear how this move is dead, but I think the support is very effective. 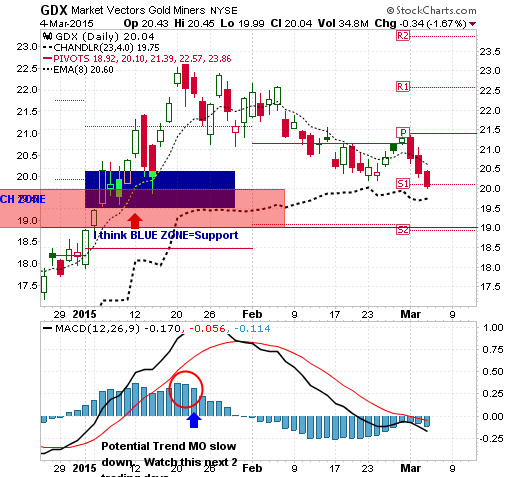 Previous sell volume in the 18-19GDX level has cleaned it out of sellers, so as to provide support from buyers now. Bottom line here is the Long Term form of the INDEX is correcting prior to re-asserting the up-leg. Left pix is the Long Term form of the above. In addition to being very witty and observant in months past about the death of this Gold Bear Market, there is another hint here, but it takes both charts to pick it out. Below we have the LONG TERM Gold Miner Index Breadth Oscillator Chart, known as JIMBO, from its daily counterpart GIMBO. The above is the graphic of the Fast and Slow parts of the WEEKLY Advance Decline Oscillator and the last time we got a definitive BUY CROSS was 18 mo's ago, so its a LONG TERM Measure. Below comes a slightly different version. What differs between the Breadth Oscillator, and the Volume Oscillator, is that the VOLUME Oscillator is increasing its divergence to the upside, over the Breadth. Typically both should be moving the same direction. In this case both are, but one stronger than the other, a good scenario, as often Volume is seldom measured, thus sort of a covert measure. Thus, I watch both for clues. This is a clue. The support here, in my opinion, reaches down to 18 or so. I think this picture is enough.